The word “crypt” is derived from the Greek kryptos, which means “hidden.” At the Manila Cathedral, the crypt is located below the main altar. It shelters the mortal remains of Michael J. O’Doherty, Gabriel M. Reyes, and Rufino J. Cardinal Santos, past Archbishops of Manila. 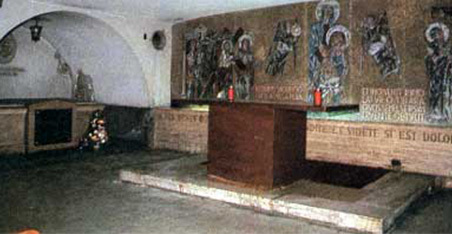 Rendering peaceful solemnity and quiet grace to the crypt is the mosaic of Marcello Avenali. The three-subject mosaic depicts the Lord’s agony on His way to Calvary, the meeting of Mary and Jesus on the way to Golgotha, and the Crucifixion. The crypt has been dedicated to Our Lady of Sorrows, and the mosaic aptly complements the crypt in theme.